Being an iPhone user, storage on the go has always been a struggle especially since you can not just switch out micro SD cards like you can on an android so I needed to find a better way. Thanks to SanDisk I have found my solution in the Connect Wireless Stick. It is the is the flash drive that allows you to work with both your computer and your mobile device. With the Wireless Stick in your pocket, in your bag or across the room, you can wirelessly access your media or transfer large files, stream HD videos and music, and save and share photos and videos to and from your mobile device. SanDisk offers 16, 32, 64, 128 or 200GB drives so you never need to worry about being out of memory. They range in price from $19.99-$119.99. With a family of 4 we can all use the extra drive space and for me if we can do it without spending extra for a cloud based service my wallet is a happy camper. I was skeptical at first but quickly fell in love with this device. I am even looking forward to bringing this on vacation with us so I will not have to worry about running out of storage on my phone taking tons of pictures and video plus I have enough storage to throw a movie or 2 on it for the plane ride. In my experience, wireless storage drives are usually too bulky to be carried around day to day, extremely difficult to set up, or not worth the effort because they won’t stream movies efficient and smooth. In my opinion the SanDisk Connect is different as it is about the size of a pack of gum, is extremely easy to set up (using the Android or iOS “SanDisk Connect” app), and it provides a very simple way to transfer files (photos, music, videos, or documents) onto or off of tablets and cellphones. Once it’s charged, and powered on, the SanDisk Connect Stick broadcasts a network signal. You then connect your mobile device to the Connect Stick’s network, and open the SanDisk Connect app. And that’s it. The app allows you to back up your Photo Gallery or Camera Roll (automatically or selectively, with or without deleting backed-up files), and allows you to transfer music, video, and document files between your mobile device and your Connect Stick (in either direction, either to or from). 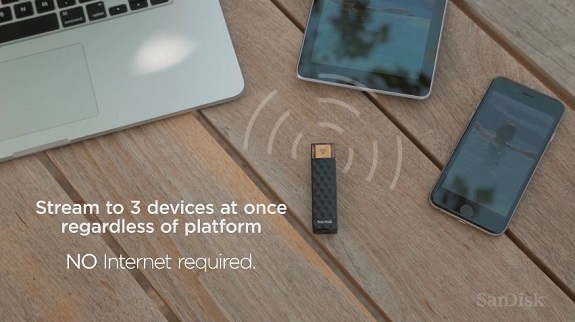 If you want to connect to the Internet while the Connect Stick is in use, the app has a “pass through” feature that will let you connect to the Internet via your home network, without disconnecting the Connect Stick. Awesome product. No lag in streaming movies and it also allows you to stream directly to Chromecast. Trick is to make sure the Chromecast, wireless stick, and phone/tablet are connected to same Wi-Fi network. The SanDisk Connect Stick charges by being plugged into a computer’s USB outlet, or into an AC wall adapter for USB and takes about 2 hours for a full charge, and it transfers many, many files before needing to be recharged. This is the wireless storage drive that I’ve been waiting for! With it, I can effortlessly transfer content (particularly photos and videos) directly from my iPhone. No longer do I have to email photos or docs, simply to back them up so that they can be erased to clear space on the mobile device. Disclosure: I received the SanDisk Connect Wireless Stick in exchange for my honest review. The opinions expressed in my review are my own. No other compensation was given.